And some of us, as this telling typically goes, have many talents and others perhaps not as much. But we all have at least one! So we pray that our one is something virtuous like patience or a nurturing spirit and not being able to shoot water out of your nose. But either way, the lesson is to use these talents, whatever they are, for the good of the Kingdom. “Don’t hide your light under a bushel,” Jesus says elsewhere, but “let it shine before others so they may see your good works and give glory to God in heaven.” And this is absolutely a good thing to do. Are you ready to learn today? And they say yes, most of the time. Are you ready to grow today? And finally I ask them, reminding them this is the most important one: Are you ready to let your light shine? And at that one they almost can’t help but answer, “Yes,” with big smiles on their faces. And yes, I’m already bracing for the day when this ritual is greeted with an eye roll. Let your light shine, church. Use the gifts and talents entrusted to you, don’t waste them, don’t hide them, but put them to use. This is good and true, and something we can’t be reminded of enough, especially in a world that in so many ways would have us believe we have little to offer. And if this is as far as we go in this parable, we wouldn’t be wrong, but we would have missed something important. In fact, as some have pointed out, it’s unfortunate the word talent here has this dual meaning because it distracts us from the scale and depth of this story. A talent was an incredibly large amount of money. One talent represented anywhere between 15 and 20 years worth of wages in those day. 15-20 years worth of daily earnings! Meaning that 5 talents was equal to far more than the average person in those days and in ours would make in her lifetime—this is an obscene amount of money we’re talking about here, which is important. Jesus is reminding us that we’ve been entrusted with something great. And this has to do with more than what we would typically think of as our “talents”—playing an instrument or a sport or a beautiful singing voice or shooting water through our nose, or whatever the case may be. Jesus is talking about something more. Not just your light, but all of life. Jesus is talking about the incredible gift of all of this. through which he overcame death; and for his rising to life again, in which we are raised to the life of your kingdom. Grant us the gift of your Spirit, that we may know him and make him known; and through him, at all times and in all places, may give thanks to you in all things. Amen. The real gift in this story, the talents with which we’ve been entrusted, is “all of it”: the whole span of life and love and failure and faith. And from this, the opportunity to drink deeply from it all, to render as much out of it as you can—and not just for yourself, but also for others. This is the Christian approach to a life well lived: that it’s lived always with others in mind, doing what you can to make sure others have every opportunity too render as much as they can too, because their life, too, is worth a great deal. We’ve missed something in this parable is we don’t marvel at the sheer generosity of theses gifts given by the master. The first two servants get it. They receive their gifts with thanksgiving and in gratitude do what they can to make something of it, and are rewarded for it. But then comes the third servant who took his one talent—still and incredible gift entrusted to him—and does nothing with it. He hides it in the ground where it serves no one, not even himself. And notice his reason why: he comes forward and blames it on his master, saying, ‘Master, I knew that you were a harsh man, reaping where you did not sow, and gathering where you did not scatter seed, so I was afraid, and I went and hid your talent in the ground.”—Does this sound like the master we’ve observed to this point in the story? The one who’s given indescribable gifts to those under him, entrusting them with his vast fortune? You could make a case that he’s a little too trusting, maybe even reckless to do such a thing, but harsh? Reaping where he does not sow? Gathering where he did not scatter? Does he sound like someone who would induce fear? The root of the problem, it seems, is that this poor servant’s perception of the master is off. He’s somehow missed the qualities of generosity and trust that the others so plainly see, and instead sees something fearful. Something to hide from and wait out. He sees this gift he’s been given not as something to receive in gratitude, but as a burden to bear, expecting bad things at the end. And this is where, if you’ll forgive, me, I depart from Jesus a bit. I want to have some compassion for this third servant because the sad truth is that there are too many people who are taught something more like his vision of God the others’. The tyrant God who’s always trying to catch you doing wrong. The petty God who holds grudges and keeps score eternally. The sadistic God who would give the gift of life only to cast you into the fires of hell. 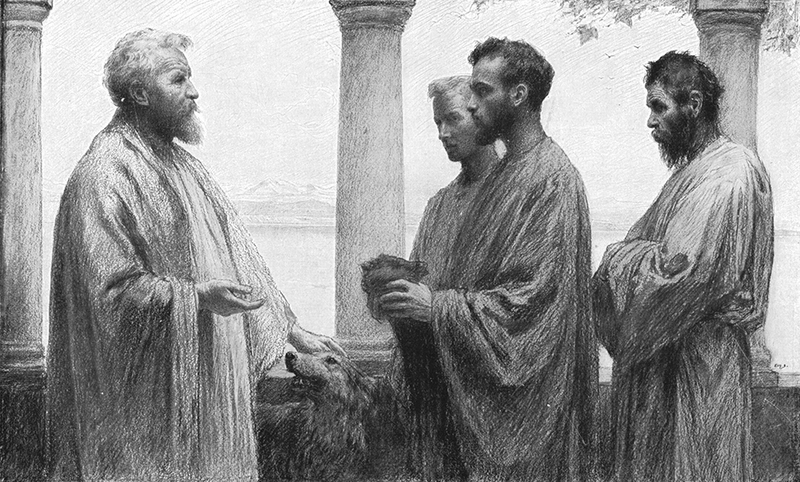 What an incredible sadness it is that this is the vision of God many learn—or more accurate, this is the vision of God many are taught, always, we should note, by other “Christians.” And so my heart breaks a little for this third servant, because he had to have learned those lies about his master somewhere. And this raises the question for us, that Jesus was finally getting to, which is: What kind of God we believe in? What kind of God to you believe in? Do you believe in the God who in so many ways would have you live a life of timidity or fear? So afraid of making a mistake that you would deny yourself the gifts of a creation that was made for you? A God who’s trying to catch you doing wrong, a God who doesn’t care, isn’t concerned, a God and a world that’s somehow “against” you? May the Lord make his face to shine upon you, and be gracious unto you. And may God take your hearts and set them on fire. More and more I’ve come to see this, the call to “risk something big for something good,” as nothing less than the call to discipleship. To see all you have, and see that it’s been given to you, and to see it for what it is, which is “big.” But then to believe in the kind of God who would have your back when you risk it for something good. The God of the rest of the benediction—the God who would “bless you and keep you.” The God whose face would “shine upon you and be gracious unto you.” The God who would think through your minds and speak through your lips and take your hearts and set them on fire. It’s only when we allow ourselves to believe in this God, the God of the rest of the benediction, that we’ll find the courage to risk something big for something good. And the truth of this parable, I think, is that which God we will know is entirely up to us. If we meet the world our hearts and our eyes and our arms closed, we will see and receive very little and may come to believe very little is out there to be received. But if we can summon enough courage to loosen our hearts, straighten our backs, lift our gaze, pry open our arms, we will find ourselves ready to receive a world of beauty and possibility and the God who created it—all that we may not have known was there. And it’s true, and it must be said, this posture assumes a bit of risk. More than a little vulnerability. It will leave you exposed, and there’s no way of denying that. But such is the risk of faith. In what God do you believe? Next week is Christ the King Sunday, the final Sunday of our Christian year together. The following week will be the start of Advent when we’ll begin the whole story again. So as we approach this ending that is always a beginning, it’s good for us to ask: In what God do we really believe? Is it the one true God, the God of creation, who has given you much and stands ready to offer even more, if you would but receive it? Amen. Tom Long’s treatment of this parable in his commentary on Matthew from Westminster John Knox was immensely helpful.